The Conservative government of Prime Minister Stephen Harper is using the October shootings in Ottawa, and the deadly assault that killed another soldier east of Montreal, to advance its authoritarian agenda. 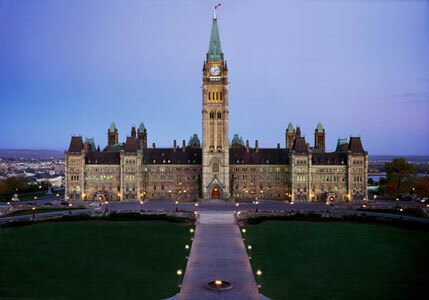 With Bill C-44, the “Protection of Canada from Terrorism Act”, Harper seeks to increase the authority of the Canadian Security Intelligence Service (CSIS) to spy on Canadians and foreigners abroad, and to share information with foreign agencies – although that might expose innocent people to imprisonment and torture, as happened in the infamous case of Maher Arar. In addition, the government proposes to give blanket anonymity to CSIS informants whose testimony federal prosecutors want to use as evidence, even though it would make it harder for accused people to defend themselves in court. This is just the tip of the ice berg. Conservative Public Safety Minister Stephen Blaney told Radio-Canada that the government may make it easier to arrest and detain people without charging them. Preventative arrest already exists in the Criminal Code. It was introduced by a Liberal government in 2002, allowed to lapse after five years, and then reinstated by the Conservatives, with Liberal support in 2013. Although never used, the Harper administration is toying with the idea of broadening the law to target not only innocent persons it believes will commit a terrorist act in the future, but also those the security services deem to be terrorists. That ‘deeming’ could include commission of ‘thought crimes’ like claiming online that terrorist acts are justified. What’s next, making it illegal to support governments on a list of regimes labelled ‘state terrorist’ by Ottawa or Washington – like those in Gaza, Iran, Venezuela or Cuba? Sadly, the assault on civil liberities is all too familiar to Canadians. In October 1970 the Liberal government of Pierre Elliot Trudeau invoked the War Measures Act. 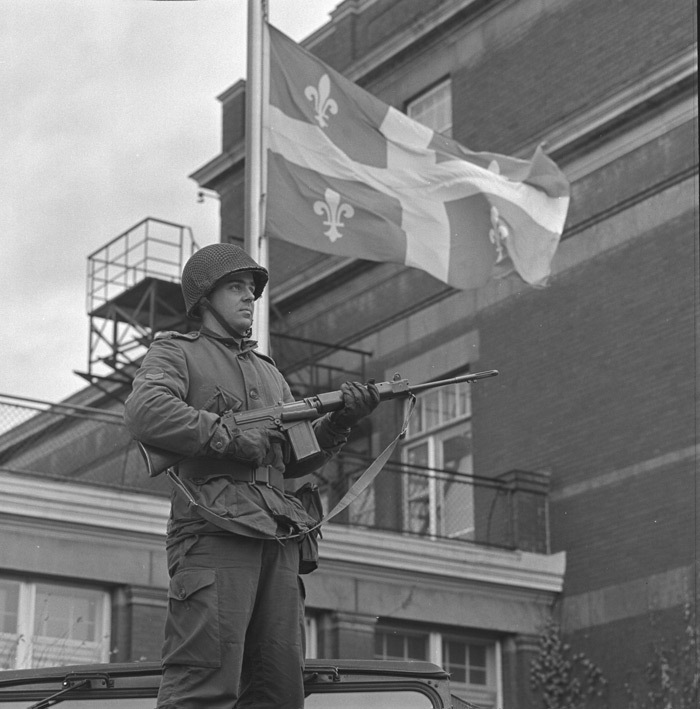 It suspended basic freedoms of speech, press and assembly after members of the Front de Liberation du Quebec (FLQ) kidnapped a British diplomat and a provincial cabinet minister, who was later murdered. Trudeau claimed that Canada faced “an apprehended insurrection”. The claim was proven false. And it also emerged that the RCMP had infiltrated the FLQ and pushed for violent actions. The repressive measures implemented by the state, including the military occupation of Quebec and the arrest and detention of over 500 labour, political and cultural personalities who were never charged with an offense, backfired big time. The ugly sweep contributed to the 1976 election of the first pro-independence government in Quebec. Unlike Pierre Trudeau (whose son Justin now leads the federal Liberal Party), Harper didn’t wait for an excuse to bring down the hammer. His Bill C-24, the “Strengthening Canadian Citizenship Act”, enables the government to revoke Canadian citizenship from dual citizens – like those who demonstrate support for a foreign power Ottawa doesn’t like. And in a related move designed to undermine social solidarity, the Tory regime has restricted the ability of refugee claimants to access social assistance. That followed its earlier decision to limit refugee claimants’ resort to universal, public health care. The fact that the latest exclusionary step was buried in a government omnibus budget bill, containing hundreds of pages of unrelated measures, says a great deal about Harper’s modus operandi, and about the growing trend of capitalist rule that must be confronted and defeated. 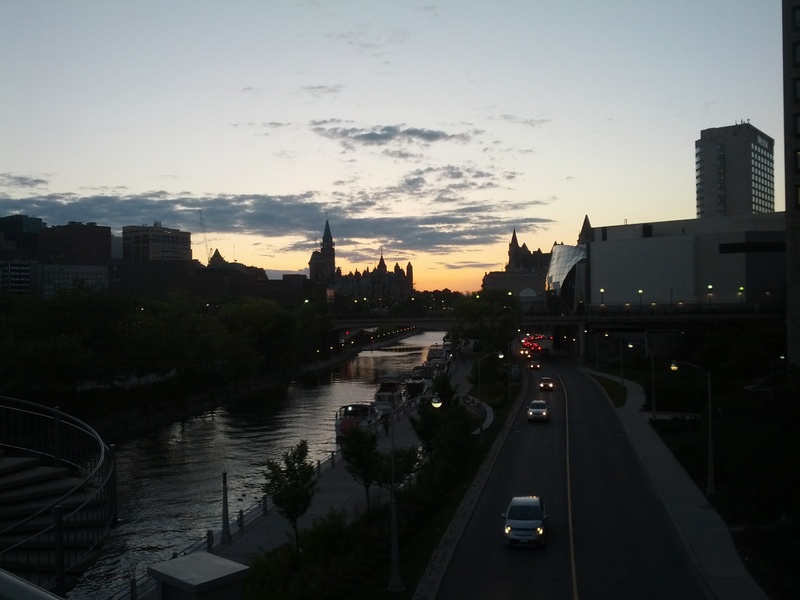 Did Intervention in Middle East prompt Ottawa shootings? Immediately after two Canadian Forces soldiers were killed in separate incidents on October 20 and 22, Conservative Prime Minister Stephen Harper called the assailants ‘terrorists’. Leader of the Official Opposition New Democratic Party, Tom Mulcair, disagreed, citing a blend of factors, psychological and political. Harper seized on the gun fight in a hallway of Parliament, in which a deranged man with a rifle fell in a hail of police bullets, to step up his assault on civil liberties. Mulcair and the labour-based NDP opposed Harper’s words, but should oppose his direction on principle, not just on semantic grounds. Against a backdrop of widespread grief for the dead soldiers and their families, Harper and the business media stoked the fires of patriotism, which spilled over into Islamophobic acts across the country. The assailants, Michael Zehaf-Bibeau and Martin Couture-Rouleau, recent converts to Islam, were not linked to ISIS. What is not known is whether they lashed out for political or personal reasons. Thus, their actions can be seen as an indictment of Canada’s faltering mental health care system. Or they can be cited as ‘blow-back’ from western military intervention in the Middle East. Or both. In any event, the context of the attack on the soldiers, and the Conservative government’s rhetoric in response to it, reveal another crack in the myth that Canada is a peace-keeping state. 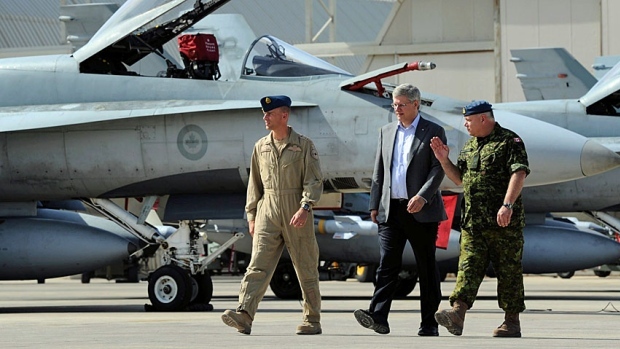 In early October, Prime Minister Stephen Harper commited fighter jets, pilots and ground crew to join the U.S.-led bombing campaign in war-torn Iraq and Syria. That came on the heels of 13 years of Canadian military intervention in Afghanistan, and Ottawa’s involvement in NATO wars in the former Yugoslavia, in the Persian Gulf, Libya, and Somalia. This is not to mention Harper’s brash support for the Israeli apartheid state, and for its brutal summer 2014 onslaught against the people of Gaza. Conservative foreign policy makes many enemies at home and abroad, but individual attacks against military personnel on Canadian soil play directly into the hands of the capitalist rulers, fanning the flames of pro-war sentiment, racism and jingoism. Stephen Harper and his collaborators, by their engagement in military interventions in the East, have certainly outraged peoples there, fanning the flames of their discontent with the West. 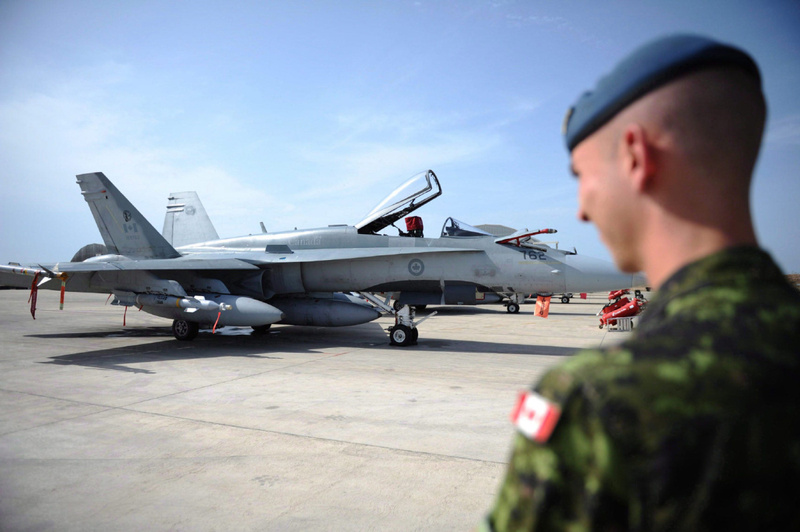 Every bomb dropped by Canadian, American and allied fighter jets on Iraq and Syria brings fresh recruits to ISIS. And the context of intervention goes back much further. In this centennial year of World War 1 it is timely to recall Canada’s contribution to the sad legacy of big power nationalism and imperialism as it continues to plague the peoples of the Middle East. Canada joined WWI at Britain’s behest to fight for the class interests of the Triple Entente rulers against those of the Central Powers. Arms producers became obscenely rich, while millions of workers died in trenches, at sea, and by aerial bombardment. That conflagration was sparked by an assasination in Sarajevo that detonated an already tense situation. For the Arab and Kurdish peoples then living in the countries now under attack, it meant the drawing of artificial borders along lines beneficial to the British and French colonial powers. The foreign rulers called that infamous arrangement the Sykes-Picot Agreement. It is no surprise that the current prime target of the Western rulers, the Islamic State, pledges to abolish the borders imposd by Sykes-Picot. Prime Minister Harper, in the wake of the Ottawa shootings, made an emotive speech that was broadcast live. In it, he condemned any and all who attack Canadian soldiers as somehow attacking all “Canadians as a free and democratic people”, and he doubled down on his “national security” plans. But one is hard pressed to recall the Prime Minister making such a hardline speech regarding the hundreds of missing and murdered aboriginal women. He continues to refuse to launch an inquiry into that ongoing tragedy. In the face of Conservative plans to legislate U.S. Patriot Act-style infringements on civil liberties, progressive and working class people should stand up to the government and its insidious plans. We should expose the big lies – the false claims that the Canadian state has a duty or right to interfere militarily in the Middle East, that the Canadian Forces are serving to protect all, rather than uphold the interests of corporate Canada, and that we should accept the expansion of the surveillance state for our own good. Instead, the streets should be filled with demonstrators demanding: Canada out of NATO! Ottawa, Washington, London and allies, Out of the Middle East! For critics of the capitalist system across the Canadian state, this was one of the largest, most representative gatherings ever. 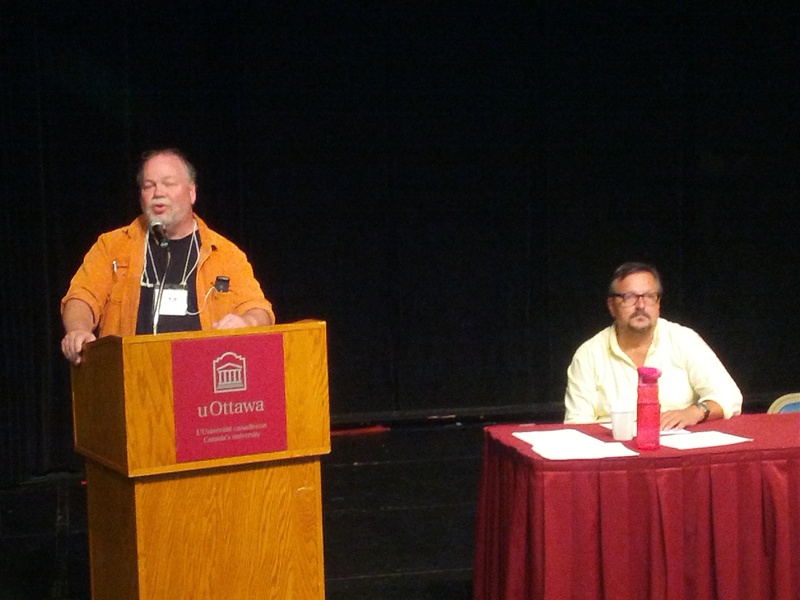 Thousands of activists from Quebec, English Canada and aboriginal communities, including workers, students, seniors and the unemployed, converged at the University of Ottawa for a four-day People’s Social Forum, August 21-24. Women constituted a large proportion of the participants. Major unions and mass organizations, whose members speak English, French and indigenous people’s languages, resourced the festival. The hundreds of work shops, and scores of film screenings, art exhibits and topical assemblies took years of planning. At the same time, this grand venue of issues, campaigns and discussions exhibited the political weakness common to the main organizers and social partners – the lack of an anti-capitalist plan of action, much less a socialist strategy centred on working class struggle. An opening day ‘Unity March’ to Parliament Hill, its contingents festooned with scores of union flags and political banners, was preceded and concluded by speeches of labour officials. They condemned austerity and neo-liberalism, but not the Liberal Party, nor the pro-capitalist leadership of the labour-based New Democratic Party. Calls to defeat the widely hated Stephen Harper Conservative Party regime in the 2015 federal election were not matched by appeals for a Workers’ Government committed to socialist policies. 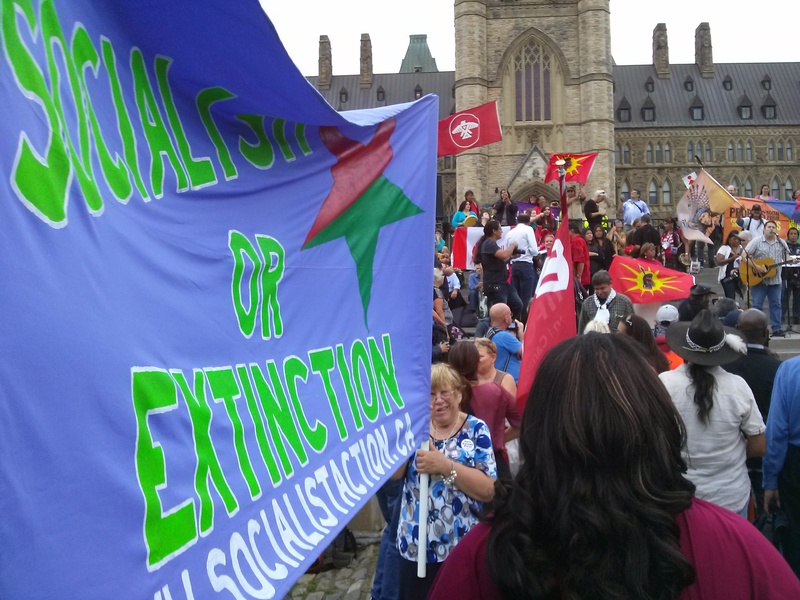 Only the last of a dozen speakers at the front steps of Parliament, Vancouver-based Harsha Walia, identified capitalism as the main enemy, and socialism as the goal. And those words were spoken as the crowd, estimated by the Montreal daily newspaper Le Devoir as between 5,000 and 10,000 at its peak, scattered under a heavy thunder shower. During four days of work shops and assemblies, activists seized the opportunity to educate and forge links on a wide range of issues, including cuts to public services, climate justice concerns, electoral reform, and the scandal involving thousands of missing and murdered aboriginal women. Dozens of simultaneous, compelling topics made it difficult to decide which forum to attend. Highlights included Palestine and Cuba solidarity, Ecosocialist strategies in the fight against Climate Change, and an assembly to Take Back the Labour Movement. Each of these attracted over one hundred participants. Under the banner of justice for Palestine, activists heard reports and discussed ways to advance the Boycott, Divestment and Sanctions campaign aimed at the Israeli apartheid state. Sadly, even as Gaza is being pummelled by the U.S.-Canada-E.U.-backed Israeli war machine, some insular leftists oppose BDS on the grounds that it ‘divides the working class’. The overwhelming sentiment of the Social Forum favoured the Palestine and global labour-backed campaign to starve the Zionist state of weapons and commerce, and to mobilize protests to end the seige and the occupation. A spate of recent sit-ins at local offices of NDP MPs across Canada has drawn broad critical attention to the reactionary pro-Israel policy of NDP Leader Tom Mulcair. Ecosocialists gathered to consider how to strengthen opposition to various pipeline construction projects, and to go farther. Their aim is to develop a class-conscious movement for socialist transformation of the carbon-burning, private profit-obsessed, capitalist energy economy. Only a planned economy under workers’ and community control can marshal the resources needed to effect such a collosal change. Many will take that message to the monster Climate Justice march scheduled for New York City on September 21. Establish a cross-union, class struggle caucus that is anti-capitalist, anti-concessions, anti-austerity and pro-union democracy. Our movement or caucus strives for change based on policies, not personalities; seeks to replace current union mis-leaders on political grounds and union democratic principles, from the bottom up. Instead of giving political support to one or another wing of the labour bureaucracy, we strive to build an independent, class struggle movement from below; we seek to change the overall direction of the unions; we support union activists who battle concessions and anti-democratic practices in the labour movement, and engage with social justice movements. Subsequent speakers at the mics endorsed these proposals, and made additional ones, mostly of a programmatic nature, such as by indicating a commitment to aboriginal rights, anti-racism, anti-sexism, for climate justice, etc. When a postal worker asked for support for the current campaign to keep home mail delivery and expand services by adding postal banking, the meeting erupted in loud applause. Later, the chair indicated that a steering committee, comprised of some 24 volunteers from across the country, would soon be convened via teleconference or skype to take the next steps to establish an active body of labour radicals and commence its work. This was widely seen as the way to confront and to replace labour officials who condone the spreading cancer of two-tier wages and benefits, a pernicious assault on young workers, and to remove bureaucrats who concede pension, workplace safety and job security losses. While reasonable to target the Conservatives for defeat in 2015, it is important to remember that Liberals are Tories too. They represent the same ruling business class. In fact, the Liberal federal government under Paul Martin made bigger cuts to social expenditures and corporate taxes than the Harper Conservatives have done. The Liberal provincial government in Ontario suspended the right to strike and imposed austerity cuts on education workers, schools, cities and hospitals. Kathleen Wynne is now known by welfare and social housing advocates as the ‘Poverty Premier’. If the People’s Social Forum represents a new political moment, it signified, at least at its inception, that the chief problem facing humanity, the environment and all species is capitalism, not simply capitalist austerity. To that degree, the PSF not only fell short of its projected attendance figures, but more importantly, of its vision for fundamental change. At the PSF, significant numbers of people argued for defeat of the capitalist parties and in favour of a working class government that would expropriate Capital and express the power of the vast majority. Many explicitly demanded that the NDP and the unions fight for socialist policies, defend the people of Gaza and Palestine, and oppose colonial occupation and imperial wars of intervention from Mali to Afghanistan, from Libya to Iraq. They called for heavy taxation of big business and the super-rich, conversion from carbon fuel consumption to green energy use, and the funding of human needs, not private profit. Socialist organizations joined anti-war coalitions, pension lobbyists, electoral reformers, Jewish opponents of Zionism, supporters of Cuba, anti-mining groups and all kinds of crafts vendors at display tables set up on a central campus pedestrian mall. Socialist Action was one of the most prominent and busy displays at the ‘People’s Square’. The SA table was staffed four to eight hours a day, sold over $475 in books, buttons and newspapers, and collected contact information from 45 people who want to keep in touch. 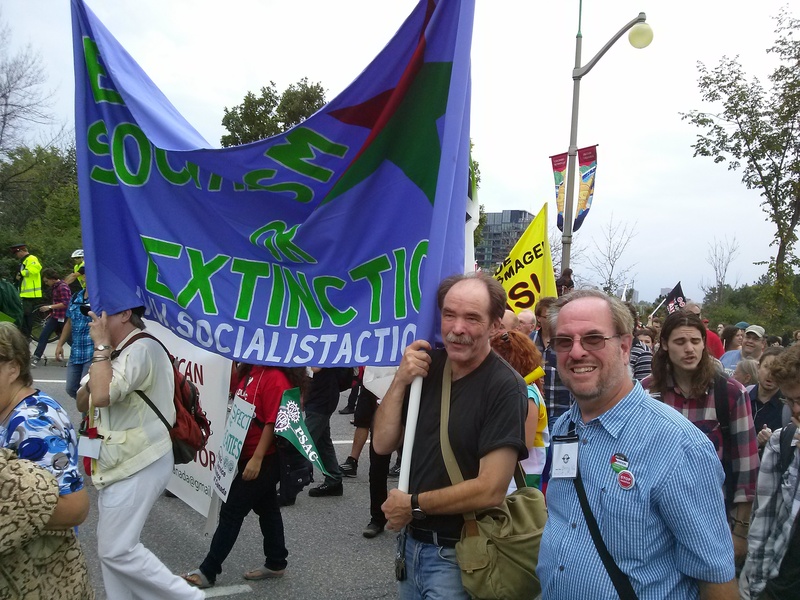 Members distributed hundreds of leaflets promoting the Toronto September 20 mass picket in defense of postal services, the Sept. 6 Ontario NDP Socialist Caucus conference in Toronto, and the SA/LAS work shop held on August 22 at the PSF. Titled “Fighting Capitalist Austerity means challenging both the corporate bosses and the labour – NDP bureaucracy”, the Socialist Action / Ligue pour l’Action socialiste work shop, with this writer speaking, attracted 24 participants. One applied to join SA, two others expressed a similar interest, and most present signed up for e-mailings. 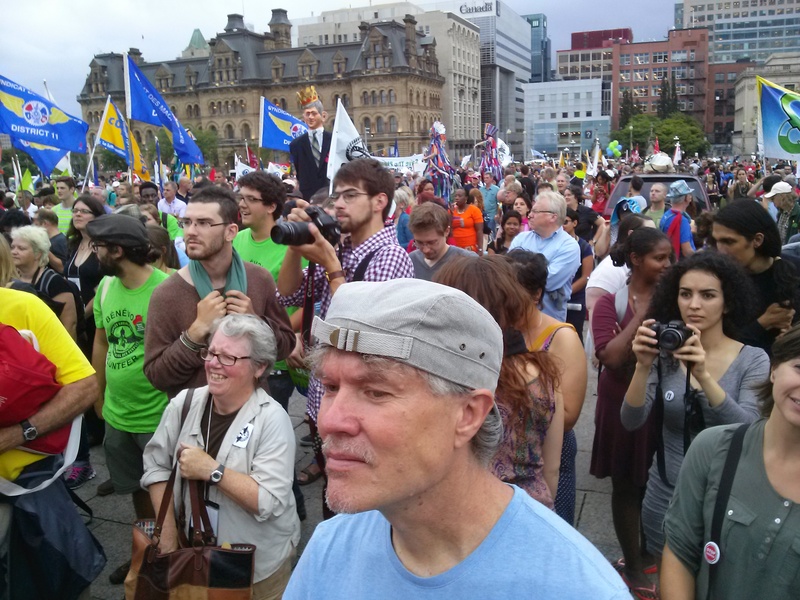 During the four days, from U of Ottawa to Parliament Hill and back, SA members sold over 100 copies of the August edition of SA monthly newspaper – a sure sign of the growing interest in socialist ideas evident at this memorable event. Speech by Barry Weisleder, SA/LAS federal secretary, to SA work shop at PSF in Ottawa, August 22, 2014. If the People’s Social Forum demonstrates one thing, it is that the appetite for fundamental change in this country is big and growing. And, at the risk of sounding like Captain Obvious, I must say that it’s none too soon. Working people, the poor and the disenfranchised, women, youths, seniors and oppressed nations have had enough. We are sick and tired of the relentless attacks on our rights and living conditions, and the plunder of the environment, all for the sake of private profit maximization. Capitalism is a decaying, destructive and increasingly violent system. We see that from Gaza, to Iraq, to Ferguson, Missouri. We see it in the layoffs at Cisco Systems in Ottawa and Toronto, and in the plan to end home mail delivery across Canada. We see it in the greedy drive of the oil barons to build hazardous pipelines across aboriginal lands and through vital waterways. For these and many more reasons, we in Socialist Action / LAS fight for the socialist transformation of society. Based on our understanding of history, which is the history of class struggles, we believe that the ruling 0.01% will not permit a peaceful, piecemeal conversion of present, class-divided society into a cooperative commonwealth. We believe that it will take a socialist revolution. To effect the fundamental changes needed to save humanity, civilization and all life on this planet from the jaws of plunder for profit, nothing less than a socialist revolution is required. And we contend that there can be no revolution without a revolutionary leadership in the form of a revolutionary party. But the kind of leadership working people in this country have been getting is the very opposite. And that is half the problem we face. The capitalist system, with its relentless exploitation and oppression, is a given. The other half of the problem are the props that uphold the system. The labour / NDP bureaucracy is one of those props. That’s why we argue that the Fight Against Capitalist Austerity means challenging the labour and NDP bureaucracy. Now here is a key point. Challenging the leadership does not mean walking away from, abandoning, or ignoring the unions and the labour-based party. To the contrary, it means being active in those organizations because millions of workers in English Canada and Quebec look to their unions and the NDP for leadership. Moreover, it is good that those organizations exist. If they were much weaker, or absent, the situation of the working class would be far worse, as it is in the USA. But challenging the mis-leaders of our class is not a task for cheerleaders or careerists. It is a task for honest workers and oppressed people who are willing to fight for a Workers’ Agenda, for good, secure jobs with decent pay and benefits, for a democratically planned, socially owned economy, and for a clean, safe, sustainable environment. Capitalism cannot provide those things. Pro-capitalist labour politicians won’t fight for them. So rank and file workers are obliged to organize inside our existing workers’ organizations to push aside those who are unwilling to lead, and to constitute a new, fighting, class struggle leadership. The obstacles we face in the NDP are the same as the ones we face in the unions. How are they the same? Allow me to spell it out for you. The ruling body of the NDP between conventions is its Federal Council. It has 72 members. 31 of those Federal Councillors come directly from the labour movement, representing tens of thousands of affiliated members. Get the picture? The folks who have wavered and bowed under the blows of the capitalist austerity drive, are the same folks who have endorsed or condoned regressive NDP campaigns and policies, including support for oil pipelines from west to east, and defense of the Zionist apartheid state of Israel, even while it is smashing Gaza to pieces. You cannot effectively challenge one aspect of the problem without challenging the other. And you cannot change Canadian society without confronting and replacing both sets of mis-leaders. Of course, there are exceptional individuals at the top, but the exceptions prove the rule. Now let’s be concrete and consider the record of the labour leadership in Canada. The prevailing theme is concessions. In sector after sector, from auto to steel, from forestry to railways, from the provincial and Federal Public Services to the Canadian postal service, bosses get the concessions they demand from labour. There are militants here who can talk about OPSEU, CUPE, Unifor, CUPW and other unions. I’m going to tell you about the teachers’ unions in Ontario. There we find an egregious example of class collaboration, and the strangulation of rank and file initiative. In 2012 the Ontario English Catholic Teachers’ Association brass agreed to concessions before the Ontario Liberal government enacted Bill 115 (the law which suspended collective bargaining and the right to strike for education workers) – and did so without conducting a vote of OECTA members. The Canadian Union of Public Employees-Ontario followed suit. Ontario Secondary School Teachers’ Federation tops mounted token protest rallies, and simultaneously negotiated local concessionary deals. In York and Niagara districts, members voted in November 2012 to reject the deals that mirrored provincial take aways, despite heavy pressure from Federation headquarters to accept. In February 2013, OSSTF suspended its ‘political action’ protest (chiefly the boycott of extra-curricular activities, which impacted mostly on students and parents). In April 2013 OSSTF capitulated to the province’s demands, with minor tweaks. ETFO, the last holdout, gave way on June 13. Discouraged by the unravelling of what began as a common front of resistance to austerity, education workers ratified the deals. But scandal dogged the leaders who did the dirty deeds. Outraged members of Toronto OSSTF demanded accountability from their District Executive which donated $30,000 to four candidates who ran for the Ontario Liberal Party leadership. Members’ indignation pursued former OSSTF President Ken Coran. Coran angrily denounced the Liberals for violating collective bargaining rights. He did so right up to the front door of the Liberal Party leadership convention in February 2013. Then Coran stood as a Liberal candidate in the byelections held on August 1. Was his candidacy a reward for services rendered? As it turned out, Coran came a distant third in London West. The NDP surprised the pundits by winning that seat, and the one in Windsor-Tecumseh. While perpetrating treachery from on high, union officials curtail democracy below. An example is the ten year ban imposed on me. I’m not allowed to attend OSSTF meetings for ten years, including the bargaining unit I organized in 1983. This is for the ‘crime’ of speaking out of turn at a substitute teachers’ bargaining unit meeting in November 2012. I demanded job dispatch list data that the local executive refused to disclose for a decade! The executive consists mostly of double-dipping retirees. Here’s a bit more background. In 2002, OSSTF officials removed the entire elected leadership of the Toronto substitute teachers’ unit on petty and false charges. They put conservative retirees in control. The right wingers surrendered an array of job security, wage and benefit gains in short order. In July 2013, activists from several unions launched a Campaign to Defend Democracy in Unions and to Rescind the 10 Year Ban. On October 30 the Greater Toronto Area Council of OPSEU voted overwhelmingly to support our Campaign, and to ask OSSTF to rescind the 10 year ban. In OECTA, officials imposed a two year suspension of Richard Brock, the elected President of Halton District Catholic teachers, for opposing the Memorandum of Agreement with Queen’s Park in 2012. The United Association of Plumbers and Pipefitters barred Brother Giancarlo Cessorronne for four meetings, until Jan. 2014, because he called the Treasurer of his Local a liar. That ‘crime’ occurred outside a union meeting. The fact is that the teachers’ top brass, and most of the entire labour leadership, would rather suppress militant members than fight austerity-minded bosses. Bureaucrats put a premium on tight control — even if it means weakening workers’ resistance to an agenda that harms the vast majority, including themselves ultimately. Meanwhile, governments have been busy imposing back-to-work legislation. In 2011 they broke strikes on the railroads, at Air Canada, and at the post office, with scarcely a murmur from the labour movement tops. Union heads kept mass job action off the agenda. Unions in Canada now encompass 31 per cent of the work force, 9 per cent less than in 1983. Average wages are now lower than in a generation. Union leaders talk about confronting the threat of so-called ‘right to work’ laws (which would end compulsory deduction of union dues at source). Remember the TV ad campaign,“Together Fairness Works”, set to the tune of ‘Sunny’. Unfortunately, it side-stepped the need to fight rollbacks in wages, benefits and pensions, and the insidious lower wage rate increasingly imposed on new hires. Such concessions undermine the confidence of all workers’ (especially young workers’) in unions. Is the 30 year pattern of retreat by Labour due primarily to an inherent lack of self-confidence? Are unions no longer suited to their task, as some academic ‘Marxists’ argue? Or does a sense of powerlessness simply flow from bureaucrats’ self-inflicted failures? The truth is that Labour’s retreat arises primarily from an aversion to struggle by union officials. Plenty of evidence suggests that where a good, strong lead is offered, large numbers of people are willing to fight the austerity agenda of growing social inequality. The massive Quebec students’ uprising showed that. The global Occupy movement, and the cross-Canada Idle No More protests testify to that. What’s lacking, at the top, is a will to fight, or even to allow the ranks to discuss that option. In the Ontario Public Service Employees’ Union, rank and file members organized a large and inspiring Solidarity Caucus. Its mission: to get OPSEU to rejoin the Ontario Federation of Labour. The Solidarity Caucus attracted much support. It helped to elect reformers to the union’s Executive Board. It did not win the re-affiliation battle. But the struggle continues. In OECTA, in March 2013, convention delegates defeated and replaced the President who signed the bad deal and denied members a vote. Meanwhile members of OSSTF and the Elementary Teachers’ Federation of Ontario formed a cross-union caucus, the Rank and file Education Workers of Toronto. REWT initiated actions to protest government policies, and union officials who approved collaboration with the Liberals, who attacked teachers’ rights. The Liberal Party won a majority government in the Ontario election on June 12, with the help of the teacher bureaucrats. In the Toronto substitute teachers’ bargaining unit, we have an Action Caucus – launched in 2003 when local control was undemocratically usurped. 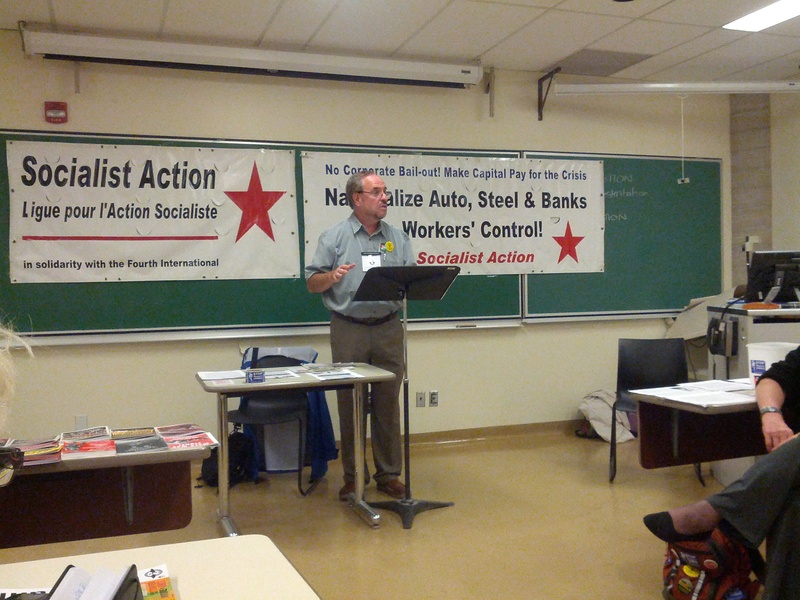 Our Action Caucus has been successful at winning policy and action resolutions at unit meetings. It has come close to getting its candidates elected. The ten year ban on me reflects the bogus executive’s fear of losing control. In CUPE, rank and file members formed a Return to Militant Labour caucus, which was active at the CUPE national convention last Fall. And keep in mind the example of Sister Lindsay Hinshelwood who ran for Unifor president at the Unifor founding convention in August 2013. She ran directly from the floor, without a fancy campaign, standing against concessions, for democratic principles, and she got 17.5% of the votes cast. Then something startling occurred prior to the CLC convention. Brother Hassan Husseini ran for CLC President on a militant, democratic platform. He campaigned across the country and gathered significant support. So much so that it prompted Hassan Yussuff to run for President. Incumbent President Ken Georgetti, and his main opponents in the bureaucracy, pulled out all the stops. 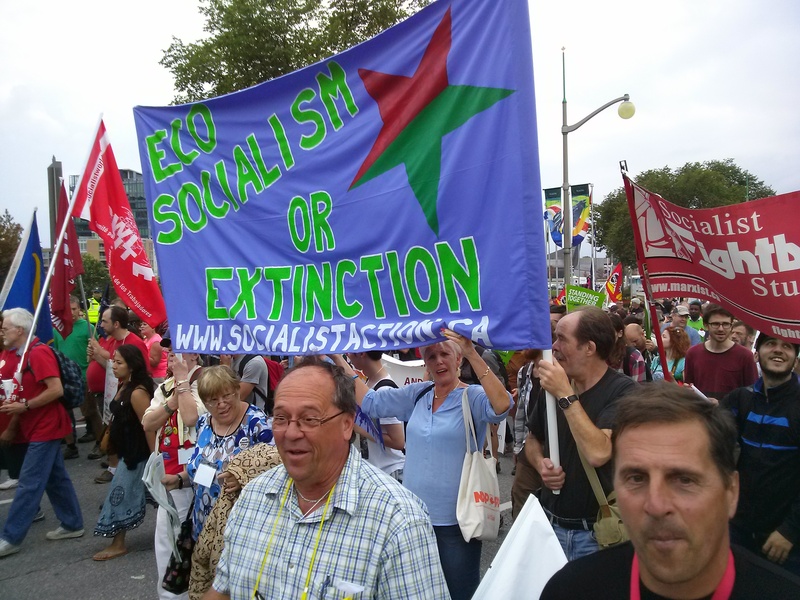 Nearly 5,000 union delegates gathered in Montreal in early May. For the first time ever, an incumbent CLC President was defeated, as was his slate. While Yussuff represents very little change, the mood in the ranks of labour is for change – more, rather than less. So…. what do these various experiences suggest? 1. The fight against capitalist austerity and union concessions requires rank and file organization in all the unions, not just for change at the top, but to promote mass job action to win a Workers’ Agenda. 2. Rank and file organization should be based on policies, not personalities. It should actively strive to replace the current mis-leaders on political grounds. Abstention from struggle in the union arena, or giving political support to this or that wing of the bureaucracy, constitute a betrayal of the fight against austerity and concessions. 3. To change the overall direction of our unions, it is necessary to build a cross union, class struggle left wing. This has been the approach of revolutionary socialists in the unions in Canada and the USA since the 1920s, pioneered by the Trade Union Education League. The TUEL, which was active prior to the Stalinist degeneration of the Communist Party, provides an example that every worker-socialist should study. How will a new generation of workers repair the damage done by the bureaucracy? Not by the so-called ‘left centre unity’ tactic advanced by the Communist Party. That tactic chains workers to the whims of liberals and opportunists. Also dead wrong is the Toronto Labour Council’s nearly exclusive focus on defeating Tim Hudak’s Conservatives who threatened right to work legislation. Don’t forget: Liberals are Tories too. Liberals curtailed collective bargaining, suspended the right to strike, and prorogued the Legislature. It is capitalist austerity that we must fight and defeat. Clearly, it will take more than an election to do it. It will take class struggle, plant by plant, community by community, through mass action, mass resistance and general strike action. That course logically leads to the fight for a Workers’ Government. Unfortunately, the NDP is moving in the opposite direction. This was evident in the Ontario provincial election in the campaign led by Andrea Horwath – which may be repeated by Tom Mulcair in the federal election expected in 2015. Now, Tim Hudak and the Tories got what they deserved. But the NDP lost the little power it had. It would have done better had it pulled the plug on Liberal Premier Kathleen Wynne one year earlier. The NDP won three new seats, but alienated vast sections of its base, while losing three seats and major ground in Toronto. The voter turnout was barely 51 per cent, a three per cent improvement on 2011, but a dismal result by any standard. Key to the disappointment was the NDP’s feckless effort. Andrea Horwath waged the worst NDP campaign since Bob Rae attempted to defend his infamous Social Contract in 1995. The NDP platform emphasized “making life more affordable” by removing the HST from electricity bills, reducing car insurance rates by 15%, opening up a few more child care spaces, shortening hospital wait times, and offering a mere $1 increase in the hourly minimum wage. At the same time, Horwath defended the practice of bribing big private corporations to create jobs – without demanding any public ownership or democratic control of state investment. Horwath projected a small increase in corporate taxation, but no plan to conscript the hidden, un-taxed billions of dollars – what a former head of the Bank of Canada calls ‘dead Capital’. That means the NDP proposed no way to fund a serious assault on poverty, on homelessness, or to end the deepening crises in public transit, education and health care. The ONDP Leader campaigned on ‘integrity’. But she failed to address her own democratic deficit. She ignored a party convention decision to be tougher on the Ontario Liberal budget of 2012/13. In fact, on her watch, party conventions provide less time for policy debate. And Horwath’s Election Planning Committee undemocratically prevents leftists from being NDP candidates. While it is gratifying that the Progressive Conservatives lost big time, it is clear that the capitalist austerity agenda continues vigorously under Premier Wynne. Wynne bragged during the TV leaders’ debate that she had implemented “80 per cent of the Drummond Report” — a harsh austerity plan. Behind Wynne’s affable smile, the locomotive of the rulers’ public sector wage freeze, social cutbacks, 3Ps, and privatization remains firmly on track. Now New Democrats, labour unionists, feminists, LGBTQ folks, environmentalists, socialists and social justice advocates must fight to take the NDP from the latter-day Tony Blairites, and re-direct the party to lead the battle against capitalist austerity, and for socialist solutions to the mounting problems we face. That starts with the demand that Ontario NDP Leader Andrea Horwath resign immediately. The situation calls for a full review of the party’s leadership and political direction, leading up to its November 14-16 convention in Toronto. The question of Horwath’s future as ONDP leader is posed daily in the mass media. A leadership race is triggered by a vote of non-confidence in the leader. A confidence vote occurs at every party convention. If even 35% of the delegates vote for a leadership review (that is, if less than 65% vote to support the current leader), in all likelihood a leadership race will ensue. Just wait to see what happens? Conduct ‘business as usual’ by submitting resolutions to the Convention, few of which ever make it to the floor? No. This is where a bold initiative is needed – which is what the NDP Socialist Caucus is providing with its demand that Andrea resign, and by insisting that a full review of the political direction of the party take place now. Naturally, the removal of Andrea is no guarantee that another leader will change direction. But what are the chances if the party ranks do not demand this? It would only help Horwath and her handlers to weather the storm. The task of socialists is to ‘fan the flames of discontent.’ On what basis should we demand that the Leader resign? It should be done on the basis that there was no mandate to turn right; indeed, that to survive the NDP must turn sharply to the left. What should be said to those who argue that it’s time to launch a new electoral party of the left? We say: Stand up and fight for your principles – but fight where it really matters. Don’t retreat into a fantasy world. It ranges from tragedy to farce. The Waffle movement had 10,000 NDP supporters in the early 1970s. But within three years of its departure from the NDP, it had disappeared. The Campaign for an Activist Party, and later the New Politics Initiative, led by Svend Robinson and Judy Rebick in the 1990s, were top-down, undemocratic structures that gave up the fight and disappeared. Four years ago a small body of dissident NDPers launched the Ginger Group. After a brief polemic, it quit the NDP and launched the Socialist Party of Ontario. In 2011 it ran three candidates. In June 2014 the SPO ran only two candidates. The Communist Party of Canada ran 11 candidates on a left-reformist platform. None of those ‘left’ candidates got more than 200 votes. The NDP got 1.1 million votes, with no support from big business. Most of its votes came from working people in heavily working class districts. The NDP remains a workers’ party, which is obvious to anyone who has been to an NDP convention. But the NDP has a staunchly pro-capitalist leadership which is out of step with reality. It seems to be oblivious to the extremely destructive decline of late capitalism. The struggle for a Workers’ Agenda will take place in the NDP, as it will take place in the unions. Not exclusively there, but there as well. Let’s hope that there will be confrontations – arising from resistence to the coming cuts. Let’s hope that union leaders, following the defeat of Hudak, do not go to sleep, as they did when the Bob Rae-led Ontario NDP surprisingly won a majority of seats in 1990. A critical test of that idea will occur at the Ontario NDP Convention in November. 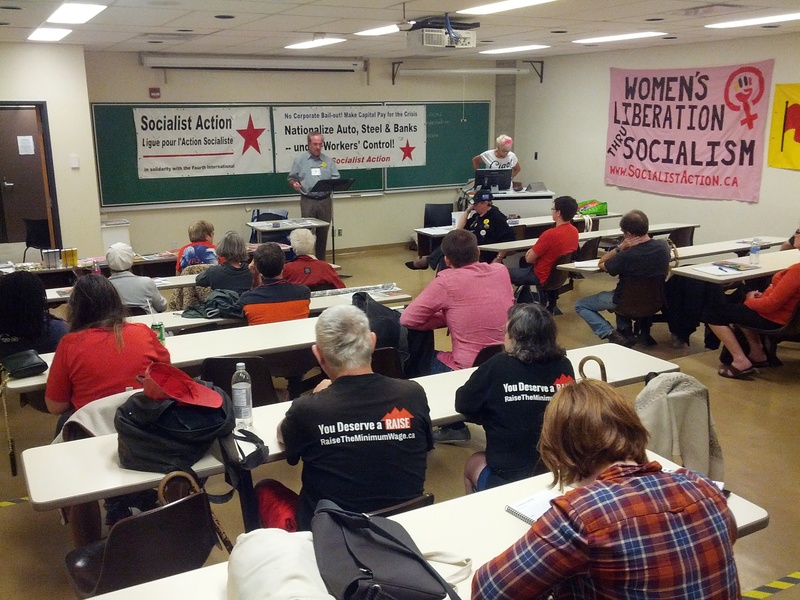 To prepare for that, the NDP Socialist Caucus will host an Ontario Conference on Saturday, September 6. It is already petitioning for a change of leadership and political direction of the party. It will decide on priority resolutions. It will select SC candidates for the ONDP Executive. It will plan the next edition of Turn Left, the SC magazine, for which a fund appeal is presently underway. Opposition to Line 9, to the Northern Gateway pipeline, and the fight to save Canada’s postal services have the same potential. The global popularity of Thomas Piketty’s book ‘Capital in the Twenty-First Century’ indicates the wide disdain for growing inequality, and the appetite for a radical new direction. The defeat of Ken Georgetti’s executive slate at the Canadian Labour Congress Convention in May is further evidence of stirrings below the surface. The militant protest of municipal workers, fighting to defend their pensions, at Montreal City Hall this week, shows the way forward. In our tortured world, anger and suffering there is aplenty. What’s lacking is leadership. Leadership is born in struggle. Join the struggle for a new leadership in the workers’ movement. That’s the key to changing this society. Let’s build a cross union, class struggle, labour left opposition. Join Socialist Action. Together we will win, and hasten the day of the socialist revolution. How ironic would it be if Prime Minister Stephen Harper’s ultimate downfall occurs due to a scandal involving some rip-off artists he appointed to the Senate, rather than as a consequence of Harper’s bestial record on the economy, the environment, First Nations and Canada’s wars of occupation abroad? Very ironic, eh? But as things go in Ottawa, where both an ominous trade deal with Europe, and a meandering but menacing Throne Speech were quickly eclipsed by the deepening Senate imbroglio, anything seems possible. The Conservative P.M. dug in his heels, and fired back at blistering Opposition attacks on his credibility. 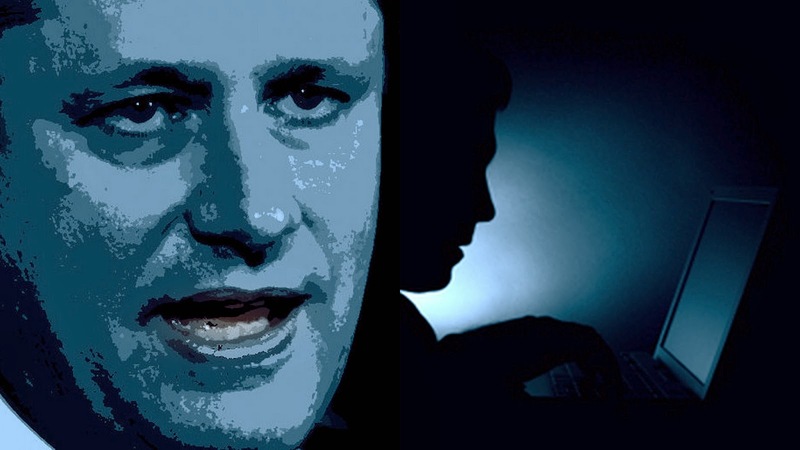 Harper insists that he knew nothing about the scheme to bail-out Senator Mike Duffy. He coldly disowned Senators Duffy, Pamela Wallin and Patrick Brazeau when scrutiny of their mis-spending habits became too hot and too damaging to the Conservative Party. Harper even prorogued Parliament in a vain effort to ride out the storm. Still the crisis persists, undiminished by the so-called free trade triumph, or the baubles offered to consumers in an otherwise toxic Throne Speech. While the political crisis, now six months old and deepening, widens rifts in Tory ranks, it is important not to lose sight of the threat to the common good posed by the still-gestating deal known as the Comprehensive Economic and Trade Agreement (CETA) between Canada and the European Union. Secrecy marked the CETA negotiations, and still shrouds the contents. Progressive economists say Ottawa’s claim that the pact will create 80,000 new net jobs is entirely bogus. Europe’s 500 million consumers are enduring an economic recession, worsened by austerity measures that curb workers’ ability to buy much of anything beyond essentials. Unifor economist Jim Stanford predicts that CETA will, over time, vaporize up to 150,000 Canadian jobs. Since 28 EU countries have to endorse the deal, and Ottawa needs to get the provinces on side by guaranteeing compensation for higher drug prices and for any harm done to home industries, there is thus time to defeat the deal before CETA is entrenched. Likewise, there is an opportunity to challenge the pernicious plans outlined in the October 16 Tory Throne Speech. Harper’s endeavour to change the channel on his Senate problems includes promises to cut cellphone roaming costs, to unbundle cable-TV channels to allow consumers to pick and choose, and to allow people to carry booze across provincial boundaries for personal consumption. But Harper’s mailed fist is revealed in core measures, such as a federal budget freeze, and curbing costs in the public sector by shedding staff. Legislation to require balanced budgets aims to entrench austerity. New laws to ensure life sentences for those convicted of major crimes, and to bar the release of serious repeat offenders, would help the Conservatives to posture as ‘law and order’ enforcers, as does their plan to shut down centres that provide drugs to addicts to wean them off dope dependency. Then there is Omnibus Budget Bill C-4, tabled in the House of Commons on October 22. Part of the 321-page compendium of assorted, but unrelated items is a piece that would give the federal government the power to decide which of the 187,000 members of the Public Service Alliance of Canada are “essential” and who therefore will be denied the right to strike. Forty thousand of them presently lack this right; many of the rest are likely to be deprived as well. Not only that, the new law would exclude dispute arbitration, except when the government agrees to it, and arbitrators would be obliged to give a “preponderance” of weight to the government’s claims as to what it could afford. Say good bye to the right to strike and to any semblence of fair arbitration in the federal public service. And this is buried in a bill that includes changes to employment insurance, workplace safety, veterans affairs, conflict of interest, immigration policy and more. But where there ought to be concern about corporate criminality in the shipment of hazardous substances, in ravaging the environment, in violating indigenous peoples’ land rights, in hiding billions of dollars in offshore banks to avoid tax obligations, ‘law and order’ seems to be missing in action. That brings us back to the parliamentary crisis. It operates on many levels. One more dimension is evident in Harper’s bid to ram through his appointment of a judge to the Supreme Court. The latest high court vacancy had to be filled, as a constitutional requirement, by a judge from the Quebec bar. Harper’s choice (for ideological reasons we can only imagine), is Marc Nadon, who once practiced maritime and transportation law in Quebec. But Nadon spent the last 20 years at the Federal Court’s appelate and trial divisions in Ottawa. So Harper aims to jam a square peg into a round hole. How? By amending the Supreme Court of Canada Act. Like suspending Parliament four times over the past seven years, like trying to bully out of the Senate his own mangy appointees, those who he shielded and defended until recently, Stephen Harper’s actions on labour and the economy are those of a man who doesn’t take no for an answer, regardless the spirit or the letter of the law. The saddest aspect of this ugly chapter is that most of the media attention focusses on the misdeeds of certain powerful individuals. But those potent hacks can be replaced by the ruling class when push comes to shove. A superficial approach to corruption, rather than a serious examination of the system that drives its minions to do what they do to perpetuate human exploitation, social oppression and the devastation of nature, is what passes for politics in the mainstream. Unfortunately, the leadership of the workers’ movement, including those who sit atop the unions and the labour-based New Democratic Party, are complicit in this artful misdirection. They demonize Harper. This in turn tends to foster a ‘get rid of him at all costs’, lesser-evil, unprincipled politics. The net effect is the mis-education of the many, helping to keep the criminal elite class in charge of the sinking ship, weighed down as it is by stupendous capitalist greed. Urgently needed is mass job action to stop the Tory attack on the right to strike, to defeat CETA, to reverse the public service cuts, to uphold aboriginal land rights, and of course, to abolish the Senate and the monarchy.